There is little talk of potato gnocchi, maybe because they have developed in the shadow of fresh pasta for which they are an almost compulsory complement to its commercial range. And yet, this product seems to be more and more popular, even outside Italy where it comes from. It should be noted that their Italian selling name (“gnocchi”) is maintained in any language, which proves both the formal and substantial peculiarity of this real made-in-Italy product. 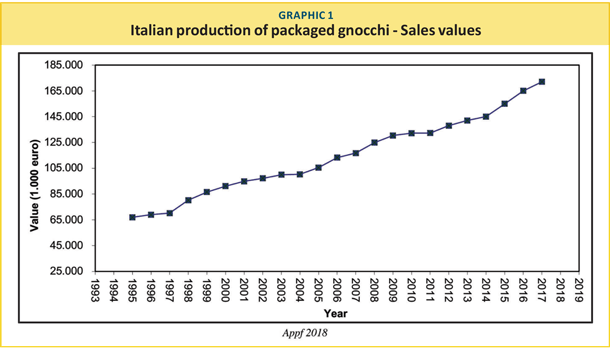 It is a fact that Italian gnocchi production industry has improved its quality over time, thus earning a place on the market. 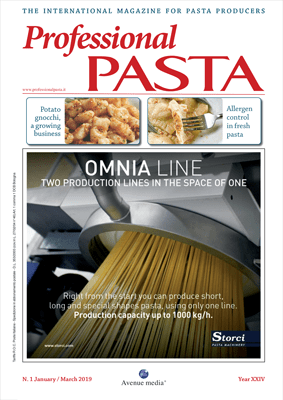 Sales have slowly but steadily increased compared to fresh pasta industry. This growth is shown in graph 1. Today the annual growth reaches more than 165 million euros. 20% of made-in-Italy production is exported to non-EU countries, under the “ambient” category (product available on the shelf). The main part (80%) labelled as “fresh” (refrigerated fresh potato gnocchi) is sold as refrigerated all over Europe, according to the methods described and “made official” in the “descriptors” of the European Guidelines relating to all food categories and contained in the Annex II of the Ce Regulation n. 1333/2008. The main ingredients are obviously potatoes: potato flake that are rehydrated when used or fresh potatoes or baked semiprocessed potatoes. Soft wheat flour is often used as pastry flour. Then, traditionally, potato starch and sometimes milk and eggs are added. “Organic”, “vegan” and “glutenfree” gnocchi can also be found on the market and soft wheat flour is replaced by corn and/or rice flour. Moreover, the market has been overwhelmed with all sorts of vegetable gnocchi (tomato, chard, squid ink). Today the market of gnocchi available on the shelf has dropped to 20% – or maybe even less, whereas it accounted for 80% twenty years ago. A real invasion of refrigerated gnocchi which clearly means more quality. Gnocchi production and marketing are developing. Today Italy has a top competitor in Europe, i.e. France. France is building modern and large production sites, but the quality of French offer is lower. For the rest, the Italian market is performing well, even though the negative economic period leads to persistent limitations, having France, Germany, Great-Britain and the Eastern countries as European benchmarks. The production as copacker is outstanding; this selling system has become extremely popular in Italy and is present all over the world. A part from +4.5% reached in 2017 in the Italian market and more than +8% in the organic production branch, the trend goes on successfully. 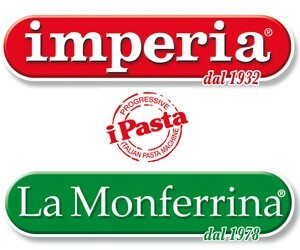 The main producers are Grandi Pastai Italiani (Di Martino is the owner and Amato is the brand), the Italian leaders of fresh pastaara Rana and Voltan. 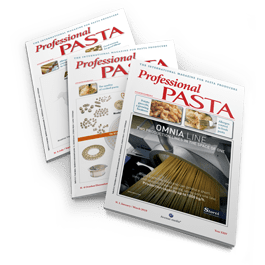 Il Pastaio di Rodengo Saiano (Italy) is the first Italian interpreter of quality product with a reduced shelf life; Carlo Crivellin is a traditional company that is growing well and is taking advantage of the drive coming from renewed structures; and finally, Ciemme Alimentari. 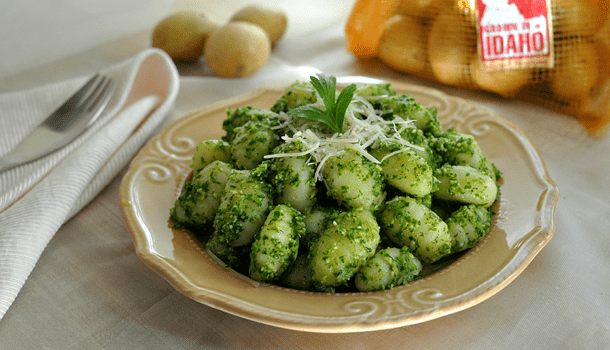 The category of fresh potato gnocchi (instead of potato flakes) is represented by Buona Compagnia Gourmet, a food company that is showing undeniable quality and can rely on a renewed management. Personally, I see a bright future for potato gnocchi, since this market has not reached saturation point in Italy. 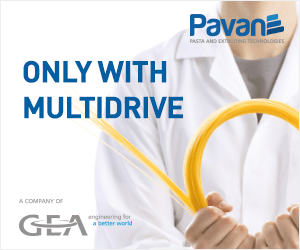 Promising and unexplored perspectives lay ahead of the European and global market.